Former UKIP leader and MEP Nigel Farage was delivering a speech in the European Parliament on Wednesday in support of US President Donald Trump’s travel ban. But one fellow MEP was clearly not impressed. 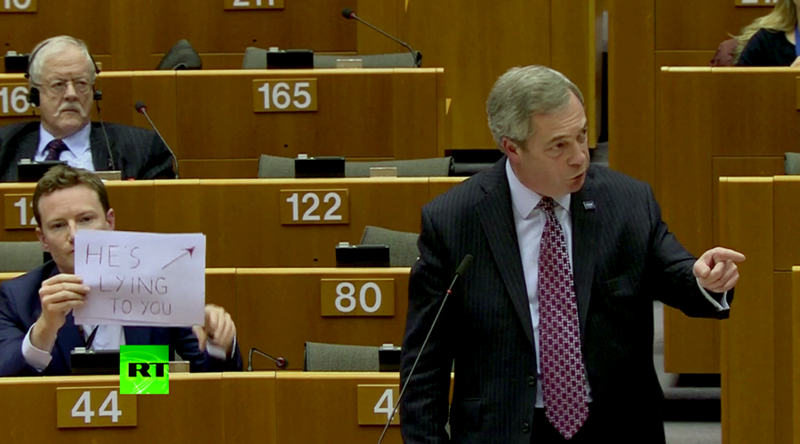 British Labour MEP Seb Dance decided to make a sign telling the rest of Brussels that Farage was fibbing. Official footage shows a man in a white tie walking up to Dance and telling him off for the prank. Farage had also suggested that perhaps the European Parliament should invite Trump to visit. After being elected President, Trump argued in his very first UK interview that the country had been "smart" to vote for Brexit and that leaving the European Union was a "very good thing." Dance is yet to comment, but was happy to share footage of his one-man protest on Twitter. After being elected President, Trump argued in his very first UK interview that the country had been "smart" to vote for Brexit and that leaving the European Union was a "very good thing."